Everybody is talking about this new Schlop Wars teaser that came out today. What does everyone think? I can't believe we will be getting a new Schlop Wars movie next year. Posted: Mon Dec 14, 2015 8:58 am Post subject: Schlop bores? Well, here we are a year later and no one responded about the Schlop Wars trailer? Maybe it won't be as popular as pundits are predicting. Gulliver is planning to go see it this week using his free movie ticket. So I guess we will see if it lives up to all the fuzz - I mean buzz. I heard that Schlop is so adament about avoiding spoilers that he is traveling to ancient Indian cliff dwellings where there is no wifi this week. If Schlop Wars makes more on opening weekend than Jurassic Schlops - then I win a McFurry! It's been so many years since I had a McFurry I forgot what they taste like. I think the odds are in your favor, little guy! Posted: Tue Dec 15, 2015 3:25 pm Post subject: A Schlop Wars miracle! I walked all the way to the Moolah theater to turn in my stamp sheet for a ticket to Schlop Wars - only to find out that they weren't accepting stamps for Schlop Wars by decree of the studio! It was a huge disaster as I didn't have my wallet on me (I don't have any pockets). Then out of the brown Lee wired me $5 and 50 cents to buy a ticket! It was her second great Hannukah gift even though Hannukah officially ended yesterday. Wow I couldn't believe it. First she got us bears a flannel bed-spread and now a golden ticket for me to see Schlop Wars VII. Lee has made this the best Hannukah ever! May the force be with her always! Only 1 day, 17 hours, and 24 minutes until I am going to see the new Schlop Wars (thanks to Lee)! Me and DJ have been rewatching the original trilogy and yesterday Luke got his arm chopped off by Darth Vader. But he was able to get a new arm put on. It seems like they have pretty good arm technology. He also hung out a lot with Yoda who looked kinda like Duddles. Posted: Tue Dec 22, 2015 7:55 am Post subject: Nothing but Schlop Wars! Snuffles told me that his snources told him that Schlop might go see Schlop Wars today! This is exciting news! We could then talk all about it without worrying about spoilers. But did you know May 5th is known as Revenge of the Fifth? Seems like a lot of effort! What other movie / album combo do you guys think would be good to do like this? Posted: Mon Oct 09, 2017 11:02 am Post subject: Porgs! Duddles please don't post any spoilers. There is a new trailer for Schlop Wars the Last Schlop coming tonight during Monday Night Sneechball. Lee and I will probably watch it together as is our wont. I just heard that Rian Johnson (director of Schlop Wars) said not to watch the trailer if you want to go in to the movie clean. I personally like keeping my paws clean so I don't think it is wise for Lee and I to watch it. Posted: Tue Oct 10, 2017 9:02 am Post subject: Porg fever! Should we have a thread just for Porgs? Do you think Porgs are space bunnies? Posted: Sun Nov 19, 2017 7:34 am Post subject: Porg trouble? 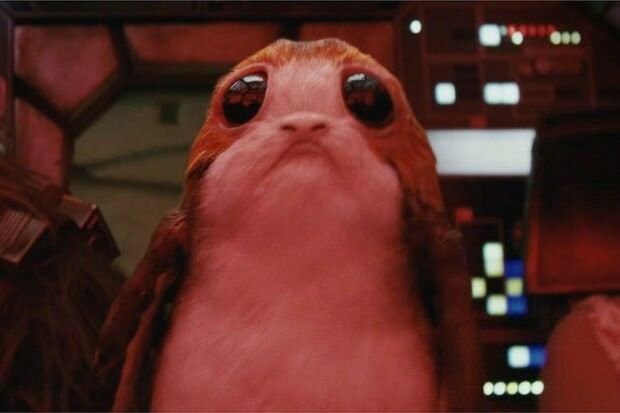 Why do all the Porgs look so sad? Do you think there will be happy Porgs too? Posted: Thu Dec 28, 2017 10:45 am Post subject: And the Oscar goes to... DJ! There has been quite a bit of excitement about the new character DJ who is the star of the new Schlop Wars movie. DJ is a rogue rapscallion who is able to break in and out of any where in the entire galaxy. (Much like how I can slip into a backpack or flannel pillowcase unnoticed) In fact, the entire plot depends on DJ.